StoryPlace is an interactive site from the Public Library of Charlotte & Mecklenburg County. 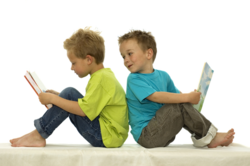 It offers children online experiences with stories that would usually be available at the physical library. The colorful graphics and lively animations are sure to appeal to the younger set. Flash 4.0 is necessary to view the animated stories and activities. Navigation is intuitive even for tykes. StoryPlace, presented in both English and Spanish, offers children the opportunity to view online stories, participate in interactive activities, and print activity pages. Five themes are currently available in the Pre-school Library: colors, teddy bears, crocodiles, animals, and monkeys. Each section features activities centered on the theme. For instance, in the teddy bear theme, children can choose to view and listen to the story 6 Little Teddy Bears, help Bella Teddy Bear choose the correct clothing for the weather, or print a teddy bear doll to cut out and put together. There is also an annotated booklist for each theme. The site developers plan to add an Early Elementary Library soon.